"Es Alpokat, Es Alpukat or Es Apokay" is a must have when you visit your neighbourhood Indonesian restaurant, or make it something you must have on your next trip to Indonesian restaurants in Singapore. 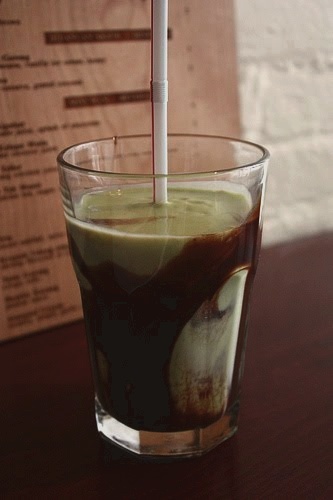 There is a chocolate of coffee variation which is traditionally served over ice in Indonesia. However, I personally think the smoothie version is the best. The Indonesians love a glass as an afternoon snack. Using whole avocados makes it very filling and nutritious! Although the western version uses vanilla ice cream, the Indonesians make thiers with condensed milk. I’ve included the coffee and chocolate "Es Alpukat" recipes for you to try out in your own homes! Enjoy! Put 1 cup crushed ice, 3 tbsp. water, avocados, and sugar into a blender and puree until smooth and sugar has dissolved, about 1 minute. Divide between two tall 10-oz. glasses and pour chocolate syrup and milk into each glass. Serve with a spoon and straw. Make a simple sugar syrup by combining the sugar and the water in a small saucepan over a medium-high heat. Stir until the liquid is becomes clear. Remove from heat and let cool. Spoon out the avocado pulp and place in a blender (you could use a hand blender and make up the smoothies in the cups, it saves on the washing up later). Add the syrup mixture and blend. Add the cold milk and blend again. Divide between 2 tall glasses. Top each serving with 1/2 the chocolate milk (to form a separate layer) and add the crushed ice. 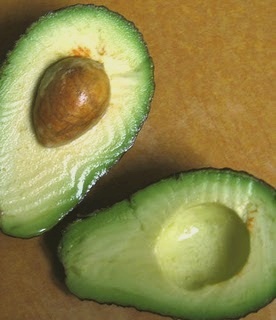 Scoop avocado flesh into a blender, then puree with remaining ingredients until completely smooth, about 1 minute. Avocados provide nearly 20 essential nutrients, including fiber, potassium, Vitamin E, B-vitamins and folic acid. They also act as a "nutrient booster" by enabling the body to absorb more fat-soluble nutrients, such as alpha and beta-carotene and lutein, in foods that are eaten with the fruit. i would add vanilla ice cream ball on top of it! nice..